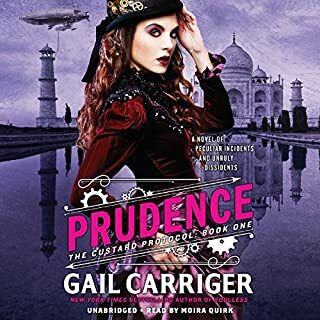 From New York Times best-selling author Gail Carriger comes the delightful sequel to Prudence. Rue and the crew of the Spotted Custard return from India with revelations that shake the foundations of England's scientific community. Queen Victoria is not amused, the vampires are tetchy, and something is wrong with the local werewolf pack. To top it all off, Rue's best friend, Primrose, keeps getting engaged to the most unacceptable military types. Rue has family problems as well. Her vampire father is angry, her werewolf father is crazy, and her obstreperous mother is both. Worst of all, Rue's beginning to suspect what they really are...is frightened. I loved the Parasol Protectorate and the Finishing School series. In both cases, the narrators Emily Gray and Moira Quirk respectively, brought the series to life. However, the choice of Ms. Quirk here, is a mistake. 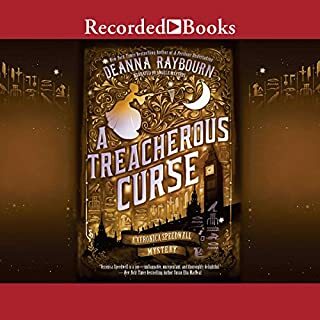 The Custard Protocol as read by Ms. Quirk, makes Prudence sound like Sephronia and the secondary characters we came to love under Ms. Gray's voice (Akeldama, Alexia, Lord Maccon, Floote, Biffy) completely unrecognizable for the devoted listener. In some cases, the pronunciations were so different (Rabiffano, BUR as "bur" not B-U-R) that it was beyond disconcerting. Akeldama sounded exactly like Professor Braithwaite. Some consistency at the very least would have been good. There was also little vocal differentiation between Rue and Primrose, so at times it wasn't possible to tell who was speaking by their voice. Unusual given Ms. Quick's deft vocal handing of Sephronia and her best friend Dimity. I would have had Ms. Gray continue the Alexia-based storyworld. While these things don't speak to the plot, the interfere with the ability to transport into the story, making the experience less satisfying at the outset. However, the problems with Imprudence went deeper than just the narration. I started it once and lost interest, but came back again due to my regard for the author. It was disappointing relative to the cleverness of previous books. My guess it that it's hard to satisfy readers/listeners who have expectations from previous works, but this was not up to previous standards. Without the significant backstory from the Protectorate books, this would have been an even thinner experience. 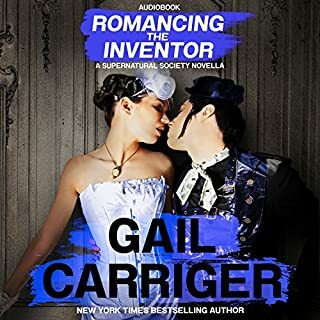 Listen knowing these shortcomings and you will probably enjoy Gail Carriger's unique voice. No. 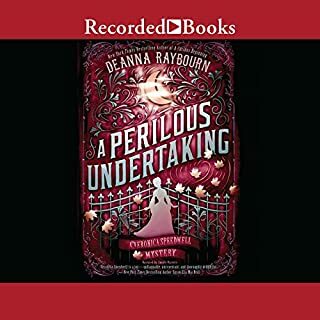 While I loved the Parasol Protectorate series I was distracted and disappointed by the transition to another narrator. Moira Quirk changed the accents and added a "fang lisp" to Dama which in the Parasol Protectorate was mentioned to be a faux pas or in poor taste/unacceptable. Biffy changed to sounding like a he was from Transylvania! Love the stories. Maybe would have rather read the book instead of audiobook. Smoother transition with accents and pronunciation from Parasol Protectorate. What didn’t you like about Moira Quirk’s performance? Totally changed accents of key actors in depicting ethnicity and added fang lisp to Dama. Her voice is not unpleasant but the changes were awful. Was Imprudence worth the listening time? If I had known, I wouldn't have bought it. If books are going to change narrators they should do their homework like an actor would and depict the characters more seamlessly from previous works with same characters. It was maddening. What is up with the voices?? I love these stories, but the voices changed for this version, despite the same narrator. Why?? Why are all of the secondary characters' voices so different. I'm finding it so distracting, and it's definitely taking away from my enjoyment of the story. This was a wonderful continuation of the Custard Protocol. 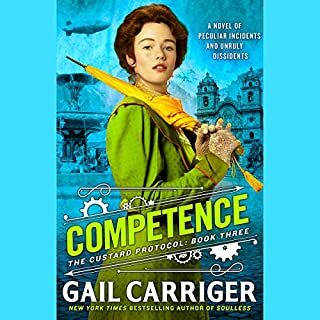 There are at least two more books scheduled for this series; although Carriger said on her blog that the next Custard Protocol book will not be released until 2018...sadness :-( All the books in this series have been incredibly entertaining and just a ton of fun. I listened to this on audiobook and the audiobook was excellent. The narrator does an absolutely wonderful job narrating and it was a joy to listen to. I kept finding myself creating reasons to listen to the audiobook so that I could listen to more. 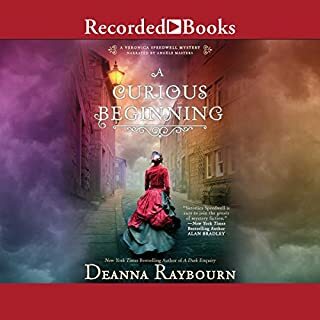 I would definitely recommend listening to on audiobook if you enjoy audiobooks. 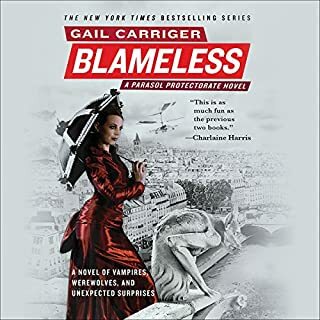 I pretty much love everything about this series and think that it is Carriger’s best series yet. I love the quirky, yet lovable, characters and the amazing world. I love the adventure and magic as well. This is an absolutely fantastic steampunk world. This book had a bit more romance than the first. Quite a large portion of the story is dedicated to Rue and Quesnel dealing with their personal issues. I don’t usually like romance taking over the story; but I love Quesnel and Rue so much that I ended up thoroughly enjoying these parts of the story just as much as the adventures in Egypt. I love that we have immortal characters from previous series that pop up in the story, yet we also have new fresh characters that are incredibly interesting and entertaining as well. I love that there are tidbits that we learn that expand on the history of the older characters as well as the new ones. The story wraps up very nicely and could have wrapped up the whole series. However, I was thrilled to hear there will be more stories and adventures in this series. This is one of those books that I was incredibly eager to read and sad when it ended. Overall I adore this series. This story is just so much darn fun and I love the world and characters. I just absolutely loved everything about this series. I would highly recommend to those who enjoy humorous steampunk reads with some adventure and romance. I absolutely am dying to read the next book in the series. This is a delightful series while not as whitty, fun, and snarky as the Soulless series this is worth the credit. Rue and Primrose made leaps and bounds in acquiring a cohort of quirky characters to populate to man the Spotted Custard. While many of the characters are not supernatural nor are there as many steampunk gadgets the books has charm. There are many "modern" relationships while shocking in the Victoria Era are very contemporary today. Rue and her crew are beginning their age of majority (21 years old) by cutting all family bonds of pack, leaving the home of her vampire father and dropping Rue's parents to their retirement home in Egypt. They then cavort the globe to save a Pride put in danger from Percy's behavior. There are many air battles with a cameo appearance of The Parasol and an appearance of a family servant with stories of Rue's grandfather. Are the battles because of the tank that Quesnel put on the ship or because there is werelioness on the ship? Do we have a new supernatural, peternatural or meta-human plot or just a family fight. The first two (Prudence and Imprduence) do not have the same bang as the first of the Soulless series, but I feel this series will bring surprises. I've loved the soulless series, and this followup is great. 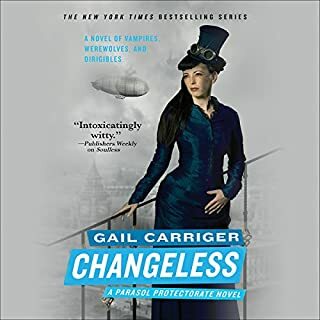 It's not the best, most pivotal novel in the world, but it is full of humor and adventure - as per Gail Carriger's usual. Enjoy the light listening and good voice acting. Wonderfully witty and entertaining story! This is not a stand alone book, as it's set in the world developed by previous stories. 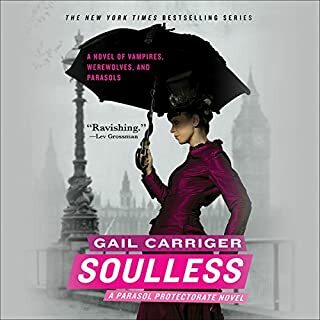 I recommend starting with Prudence's Mother's story 'Soulless"' (Soul less) in the Parasol Protector series, of which there are 5 books. Then start off with this series, 'The Custard Protocol' (I'm still laughing at this name!) The Finishing School series is a stand alone and predates the beginning of Soulless. However, you don't have to listen to it first, but can start off with Soulless if you wish. 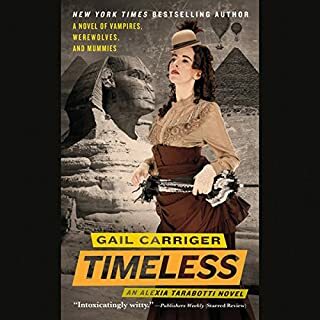 I love Gail Carriger's writing and wit so much that I've attended one author signing at Powell's books and will be attending another next week. She creates strong female characters set in a steampunk world. All too often other authors only write where men must be alpha, which I get tired of. 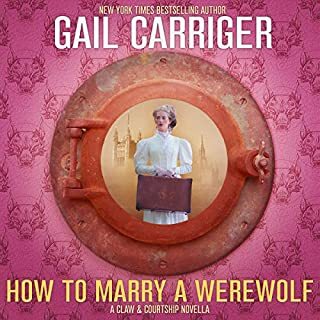 (I'm a natural pack leader myself) However, Gail's writing showcase's the way these female characters forge their way through the world, and in the process are quite entertaining. These are not women who are weak, or even looking for an alpha man, as they're quite capable of looking after themselves with the help of their friends. Each of the characters has their own strength, whether male or female. When I learned of this new book in the series I couldn't wait. In fact, I counted the days until it was available and then stayed up till after midnight, just so I could purchase it right away on Audible. This book isn't only entertaining for women either. My Sweetheart actually loves this series as much as I do! What a surprise! He's normally more into science fiction, mysteries and such, liking more mayhem and violence in his books than I do. But he equally likes Gail's writings and attended her signing event with me and will also be going to the next one. Moira Quirk, as always, delightfully narrates in such a way that I hear the different personalities shining through. 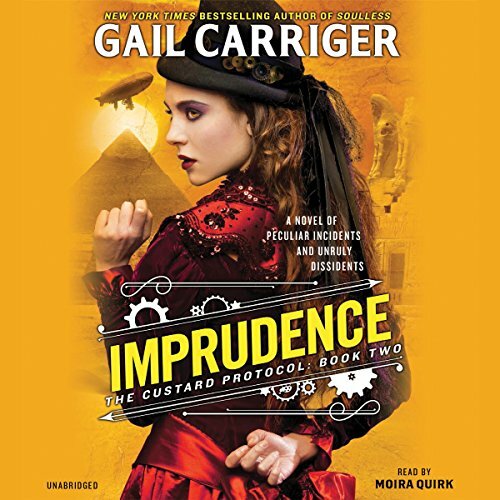 The voice for Prudence is especially entertaining, as it brings home the vibrant personality that Gail has created. 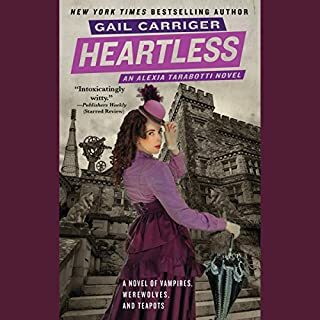 The characters and story are maturing, plots and relationships are deepening and the Gail Carriger / Moira Quirk continue to be a terrific pairing. I was only so-so on Book 1. This second installment is better in every way. I was sad to get to the end of this adventure and look forward to the next. I guess I'm more disappointed that this story is all about the daughter, and it just kind of ends short. Also I could never figure out what the daughter was calling her father. I thought she was calling him Paul all the time. The story doesn't really take off until right before the end of the book. i love this series. the story line is great. can't believe the book is over. I love the imagination of the author. the story line is so believable.